Despite tough rhetoric decrying Russia's increasing military involvement in Ukraine, European Union leaders on Sunday stopped short of imposing new sanctions against Moscow right away. Instead, the 28-nation bloc's heads of state and government tasked their executive body to "urgently" prepare tougher economic sanctions that could be adopted within a week, according to EU summit chairman Herman Van Rompuy. The decision on new sanctions will depend on the evolution of the situation on the ground but "everybody is fully aware that we have to act quickly," he added. The EU leaders call on Russia to "immediately withdraw all its military assets and forces from Ukraine," they said in a joint statement. NATO said this week that at least 1,000 Russian soldiers are in Ukraine. Russia denies that. 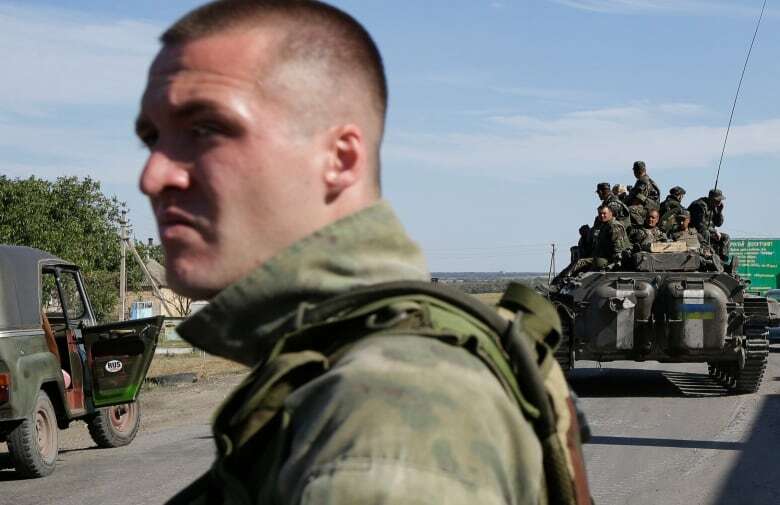 NATO also says Russia has amassed some 20,000 troops just across Ukraine's eastern border, which could rapidly carry out a full-scale invasion. A pro-Russian rebel watches as Ukrainian troops are evacuated from a rebel-held town in eastern Ukraine on Saturday. (Sergei Grits/The Associated Press)The fighting between the military and Russian-backed separatists in eastern Ukraine has so far claimed 2,600 lives, according to UN figures. The U.S. and the EU have so far imposed sanctions against dozens of Russian officials, several companies as well as the country's financial and arms industry. Moscow has retaliated by banning food imports. "If Russia continues to escalate the crisis it will come with a high cost," said EU Commission President Jose Manuel Barroso. "It's time for everyone to get down to the business of peace-making. It is not too late, but time is quickly running out," he said. Several European leaders had called for additional sanctions at the outset of the meeting in Brussels, but the fear of an economic backlash apparently prevailed and led the bloc to grant Russia another chance at avoiding tougher action. New sanctions would have required unanimity among the leaders. Russia is the EU's No. 3 trading partner and one of its biggest oil and gas suppliers. The EU, in turn, is Russia's biggest commercial partner, making any sanctions more biting than similar measures adopted by the U.S.
Ukrainian President Petro Poroshenko, who briefed the leaders at the beginning of their talks, said a strong response was needed to the "military aggression and terror" facing his country. Efforts to halt the violence in eastern Ukraine were "very close to a point of no return" and failing to de-escalate the situation could lead to a "full-scale war," he warned. 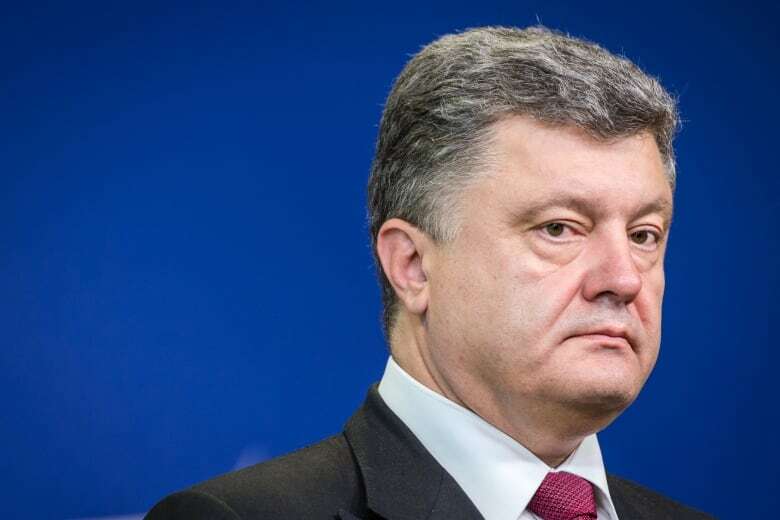 Ukraine's President Petro Poroshenko met with EU leaders Saturday to ask for harsher sanctions against Russia and a tougher response to the alleged Russian troops operating in the east of Ukraine. (Geert Vanden Wijngaert/Associated Press)Conceding ground in the face of a reinvigorated rebel offensive, Ukraine said Saturday that it was abandoning a city where its forces have been surrounded by rebels for days. Government forces were also pulling back from another it had claimed to have taken control of two weeks earlier. The statements by Col. Andriy Lysenko, a spokesman for the national security council, indicate that Ukrainian forces face increasingly strong resistance from Russian-backed separatist rebels just weeks after racking up significant gains and forcing rebels out of much of the territory they had held. The office of the Donetsk mayor reported in a statement that at least two people died in an artillery attack on one of Donetsk's neighbourhoods. Shelling was reported elsewhere in the city, but there was no immediate word on casualties. Lithuanian President Dalia Grybauskaite said Russia's meddling in Ukraine, which seeks closer ties with the EU, amounts to a direct confrontation that requires stronger sanctions. Grybauskaite said the EU should impose a full arms embargo, including the cancelling of already agreed contracts, but France has so far staunchly opposed that proposal because it has a $1.6 billion contract to build Mistral helicopter carriers for Russia. British Prime Minister David Cameron also warned that Europe shouldn't be complacent about Russian troops on Ukrainian soil. "Countries in Europe shouldn't have to think long before realizing just how unacceptable that is," he said. "We know that from our history. So consequences must follow." Moscow, meanwhile, is preparing to send a second convoy of humanitarian aid to eastern Ukraine. Foreign Minister Sergey Lavrov said Friday that Moscow has already received Kyiv's preliminary approval and insisted that it would send aid in co-ordination with the Red Cross. Lavrov wouldn't say when the aid is likely to be sent, but said it could happen next week. Russian state Rossiya 24 on Saturday showed trucks from the previous convoy at the border being loaded with humanitarian aid that was brought to the area by train. It was unclear when the new convoy could start moving. Barroso said that the EU — a bloc encompassing 500 million people and stretching from Lisbon to the border with Ukraine — stands ready to grant Kyiv further humanitarian aid and financial assistance if needed. The bloc will also organize a donors' conference to help rebuild the country's east at the end of the year, he added. Are sanctions on Russia beginning to bite?